Michael Cohen, a longtime personal lawyer and confidante for President Trump, said Monday his "first loyalty" rests with his family. Michael Cohen, the personal lawyer and longtime fixer for the president who once said he would "do anything" to protect Donald Trump, now says his "first loyalty" rests with his family. In an interview with ABC News, Cohen acknowledged that he soon could face criminal charges in an ongoing FBI probe of his finances and business dealings. But Cohen told ABC anchor George Stephanopoulos that he respects the prosecutors and the process. 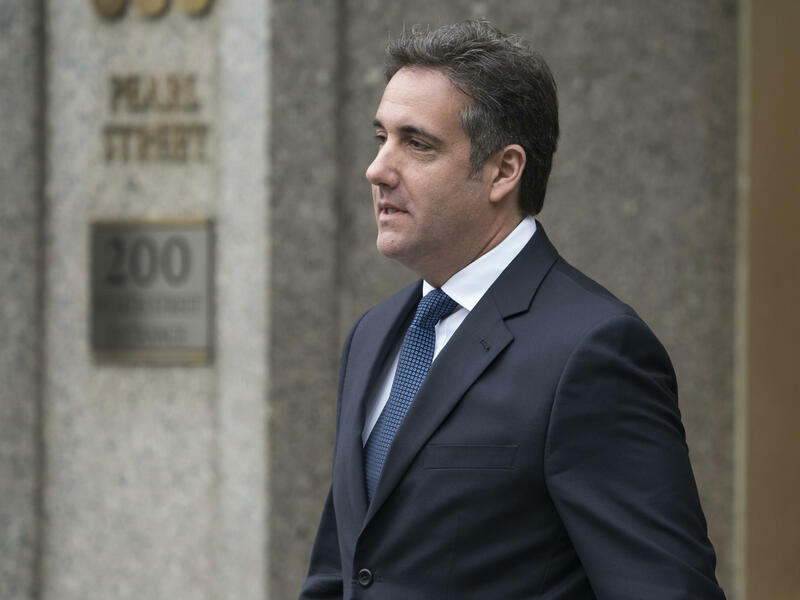 The interview offers fresh evidence that Cohen may be willing to cooperate with the U.S. Attorney in Manhattan in an effort to reduce his own criminal exposure. Cohen is enlisting a new lawyer, former New York prosecutor Guy Petrillo, who once held a leadership post in the same office investigating Cohen. It's not clear what evidence, if any, Cohen may have to offer the government about others including Trump. Cohen declined to tell ABC whether Trump urged him to make a $130,000 hush money payment to adult film star Stormy Daniels shortly before the presidential election. And unlike his most prominent client and political patron, Trump, Cohen refused to characterize the separate investigation of Russian interference in the 2016 election as a "witch hunt." "I would not do or say a thing that might be perceived as interfering with their professional review of the evidence and the facts," Cohen added. He also refused to say if Trump knew in advance about a 2016 meeting at Trump Tower between campaign officials and Russians offering "dirt" on Hillary Clinton. Cohen told ABC he is seeking "resolution." "I want to regain my name and my reputation and my life back," he said. Not so long ago, President Trump's personal lawyer Michael Cohen was telling everyone who would listen that he would do anything to protect the president. Now Cohen is telling a different story. In an interview with ABC News, Cohen says he will put his family first. NPR national justice correspondent Carrie Johnson has been following this. She is here now. Hey, Carrie. CARRIE JOHNSON, BYLINE: Hi there. KELLY: Hi. So I barely know where to start, but how about here - Michael Cohen had his house and his office raided by the FBI earlier this year. Since then, he has been pretty quiet. Do we know why he's talking now? JOHNSON: That remains a bit of a mystery right now. Cohen of course is still under active criminal investigation by the FBI and federal prosecutors in New York. They're looking at his business dealings. And normally people under investigation keep quiet. But Cohen made a different choice. He decided to talk with ABC News to send a message. The question is whether he was sending that message to prosecutors that he would give something up, give up some information in exchange for leniency, or whether he was trying to communicate with the White House to ask for a pardon or money to pay his lawyers or something else from the president. KELLY: All right, so I will note he's given this interview. He did not talk on camera, so we can't actually listen to his voice or what his tone was in all of this. But tell me a little more about what we believe he said. JOHNSON: Yeah. This was a little jarring because of course Michael Cohen had been on the record as promising once to take a bullet for Donald Trump. JOHNSON: But the message was very different in this interview he did with ABC anchor George Stephanopoulos. Cohen said, my first loyalty is to my family and my country. He said he would not become a punching bag for anyone. And he said for now he could not talk about whether Donald Trump had directed him to pay hush money to Stormy Daniels. She's of course the adult film actress who says she had an affair with Trump and got some money shortly before the election. Cohen said maybe someday he will share that information. He also declined to answer questions about whether Donald Trump knew in advance about a 2016 meeting at Trump Tower. At that meeting, campaign officials sat down with Russians who were promising dirt on Trump's opponent Hillary Clinton. It's of course one of the things being examined by the special counsel Robert Mueller. KELLY: All right, so you've touched on Stormy Daniels. You've touched on the Russia probe. Let me ask about something he apparently also said where he also broke with President Trump. This is his views about the Justice Department and the intelligence community. What'd he say there? JOHNSON: Yeah. Remember; Michael Cohen not that long ago was raided by the FBI. But he says that - in the ABC interview that he offered the equivalent of a handshake to the FBI. He says he doesn't agree with people who demonize or vilify the FBI like Donald Trump does. He said he respects the FBI. He said agents who raided his office and his home acted professionally. And Cohen also says this probe of Russian election interference by the special counsel Robert Mueller is not a witch hunt. He said he believes the assessment of the U.S. intelligence community that Russia and its leader Vladimir Putin are responsible. That's a big break with the president. KELLY: That absolutely is - fascinating. OK. Well, let me ask you this. Does the fact that he is talking at least to ABC News - does that lead us to any kind of knowledge on whether he might cooperate with the government, with prosecutors? JOHNSON: You know, Cohen may or may not have some valuable information about Donald Trump. We do know that he had a close connection with the president and was involved in his business interests for years and years, including payoffs to some women. Cohen's in the middle of changing lawyers. He hired a guy with connections to the U.S. attorney's office in Manhattan, which is investigating him. If he does want to strike a deal, that would take some time, Mary Louise. There would have to be meetings, face-to-face meetings with prosecutors and an assessment of his credibility. There's no sign that's happening yet, but it could be in the works. KELLY: NPR's Carrie Johnson, thanks so much.